Signs of ageing appear visibly reduced. Potent daily facial oil infused with 3 precious seed oils from around the world to give new life to your skin. Cold-pressed seed oils to preserve potent properties and ensure the utmost affinity to skin. 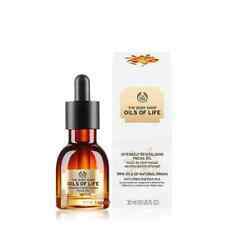 The Body Shop Oils of Life Intensely Revitalising Facial Oil 30ml Brand New. Condition is New. Dispatched with Royal Mail 2nd Class. Ginger Sparkle body polish 75ML. The Body Shop Vitamin E Aqua Boost Sorbet - 50ml. FREE POSTAGE .ROYAL MAIL . The Body Shop Vitamin E Aqua Boost Sorbet - 50ml. FREE POSTAGE .ROYAL MAIL .. Condition is New. 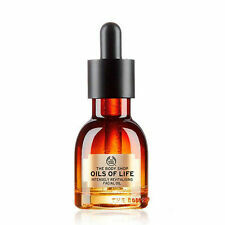 The Body Shop Oils Of Life Intensely Revitalising Facial Oil Sample 7ml. Condition is New. Dispatched with Royal Mail Signed For® 1st Class Large Letter. Kit Includes: Intensely Revitalising Eye Cream-Gel 20 ml By infusing 3 precious seed oils into an ultra lightweight and airy texture, we created this Eye Cream-Gel to revitalise the eye contour and visibly reduce the signs of ageing. So caring and so comfortable you can use it daily as a cream or weekly as a mask. Intensely Revitalising Essense Lotion 160 ml A daily lotion that provides instant visible results wile preparing and activating skin for the next steps of your routine. Skin feels instantly replenished with moisture and appears softened. Shake the bottle before applying onto face after cleansing, before a facial oil, serum or cream. New listingThe Body Shop Oils Of Life Intensely Revitalising Sleeping Cream 1ml Sample. New & unused, from a pet & smoke free home. UK bidders only, please read the title & description carefully before purchasing no returns or refunds sold as seen. 1x 1ml The Body Shop oils of life intensely revitalising sleeping mask sample. The Body Shop Drops Of Youth 1ml Sample. New & unused, from a pet & smoke free home. UK bidders only, please read the title & description carefully before purchasing no returns or refunds sold as seen. 1x 1ml The Body Shop drops of youth sample. The Body Shop Oils Of Life New 50ml. Condition is New. Dispatched with Royal Mail 2nd Class. Hemp seed oil is rich in essential fatty acids and antioxidants, crucial for skin health. The Body Shop Tea Tree Oil 1ml Sample. New & unused, from a pet & smoke free home. UK bidders only, please read the title & description carefully before purchasing no returns or refunds sold as seen. 1x 1ml The Body Shop tea tree oil sample. 7 x 7ml Oils of Life Intensely Revitalising facial oil. In 7 Convenient, small travel-friendly light bottles. (I do understand the irony in this). INTENSELY REVITALISING FACIAL OIL. OILS OF LIFE. Chocomania Beautifying Oil 100ml. Dry oil with Community Fair Trade cocoa butter and three precious nut oils: kukui, sweet almond & Community Fair Trade marula oil. Apply to damp or dry skin and dry hair. The Body Shop Oils Of Life Essence Lotion 160ml Unisex. Intensely Revitalising Facial Oil. Signs of ageing appear visibly reduced. Potent daily facial oil infused with 3 precious seed oils from around the world to give new life to your skin. Oils Of Life. Intensely Revitalising Facial Oil 30ml-Potent daily facial oil infused with 3 precious seed oils from around the world to give new life to your skin. Cold-pressed seed oils to preserve potent properties and ensure the utmost affinity to skin. Oils Of Life kit includes: Oils Of Life Essense Lotion 160ml A daily lotion that provides instant visible results wile preparing and activating skin for the next steps of your routine. Skin feels instantly replenished with moisture and appears softened. Shake the bottle before applying onto face after cleansing, before a facial oil, serum or cream. Intensely Revitalising Eye Cream 20 ml By infusing 3 precious seed oils into an ultra lightweight and airy texture, we created this Eye Cream-Gel to revitalise the eye contour and visibly reduce the signs of ageing. So caring and so comfortable you can use it daily as a cream or weekly as a mask.